Homemade hot cross buns are delicious fresh out of the oven, full of fruit and spices, and best spread with melted butter. Try to make your own at home with this easy overnight recipe. Warm the milk slightly in a small saucepan then sprinkle the yeast over and set aside for 12 minutes to prove. In a large bowl, combine the flour, sugar, salt, and mixed spice and then lightly rub the flour and butter together with your fingertips until it resembles fine breadcrumbs. Once done, make a well in the centre of the dry ingredients and slowly pour in the yeast mixture and beaten eggs. Beat until smooth with a wooden spoon or an electric hand mixer fitted with a dough hook. Add the currants and mixed peel then stir to combine. At this stage, the dough should be sticky. Cover the bowl with a damp cloth and proving lid (dinner plate or baking tray) and then pop in the fridge to rise overnight. Note: It’s always best to prepare the dough on the night of Good Thursday so it would be easier to bake fresh buns the next morning. Turn the dough out onto a floured board and knead it lightly. When done, divide the dough into 16 portions and roll each into a ball. Place the balls in the greased lamington pan about 1cm apart, cover with a large tea towel, then leave on the bench for about 45 minutes to rise. Preheat the oven to 200C and then prepare the crosses by combining flour and water in a bowl to make a soft batter. After that, use a piping bag pipe the crosses onto the buns. 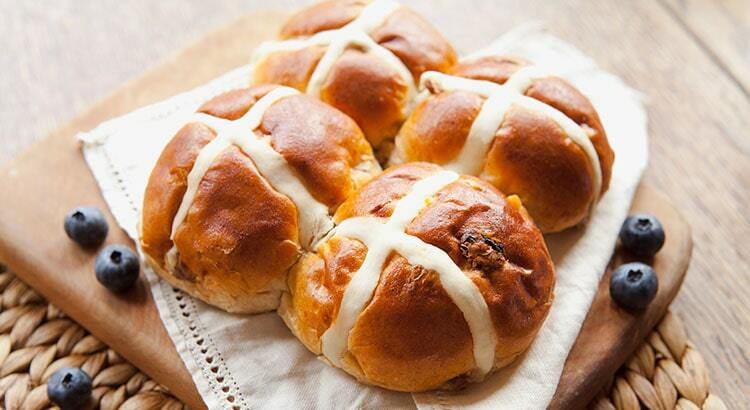 Place hot cross buns in the oven and bake for 25 minutes until they are well risen and golden brown. To make the glaze: Add sugar and milk to a small saucepan then place over low heat. Simmer until sugar is dissolved and cook for two to three minutes. Brush the glaze over buns after they are cooked and still warm. Note: If you substitute gluten-free flour in this bread recipe, ensure to add 1 tsp of xanthan gum. The hot cross bun recipe says that you need “3 brown sugar” but not what size – i.e. tablespoons, teaspoons, cups?? Can you clarify this, please? Recipe has now been amended to show 3 Tablespoons of Brown Sugar is required. 3 what of brown sugar? Tablespoons? teaspoons? Recipe looks good, but there’s a problem… 3 what? of brown sugar – teaspoons or tablespoons? Hi, I would like to try to make gluten free buns, can I substitute a blended gf flour, or is the type of flour used important to the way the mix works. If you substitute gluten free flour in bread baking recipes add 1 tsp of xanthan gum. 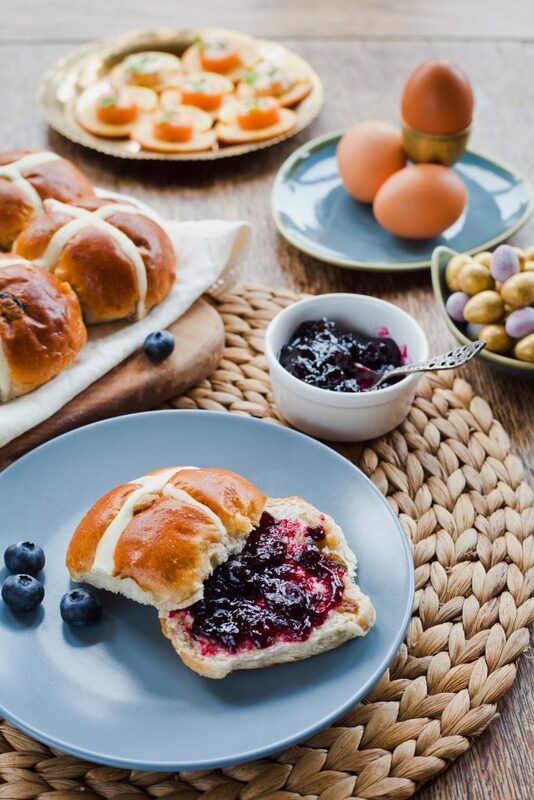 Your Hot Cross Buns Overnight Recipe says ‘ 3 brown sugar’ – is that teaspoons or tablespoons? Hi Prudence! It means leave it to prove on the counter. Hi, can you clarify what you mean by “high grade flour” – is that plain, “00”, cake flour …? High grade flour contains a good amount of gluten that is ideal for bread baking. You can use bread flour as a substitute if high grade flour is not available. Happy baking!